Hector Garcia and his rare one wheeled electric vehicle. Photo by Abraham Rodriguez. Is it a unicycle? Or do you call it a one wheeled motorcycle? A monocycle? 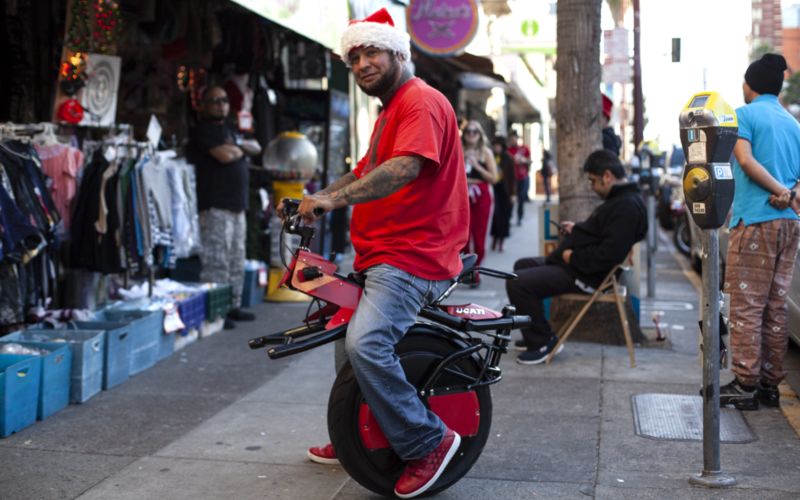 Hector Garcia bought this rare electric one wheel for $2,500 and said it’s one of two in the entire country. It rides like a motorcycle, but has self-balancing features like a typical unicycle and isn’t easy to ride at first. It charges in about two hours, but can hit some serious speeds. The monocycle, as he calls it, is not easy to ride and requires serious skill. He’s already fallen off it twice, he said. “This thing is not for amateurs, it takes a professional to ride it,” Garcia said.